these days so that NRHS National officers and Advisory Council members from all across the country could celebrate with us while in town for the Fall National Conference. Kertesz, with his wealth of experience in event planning for the Brotherhood of Locomotive Engineers, took on the task of negotiating and coordinating our needs with the Radisson. The Radisson Hotel’s history as the Lackawanna Railroad’s showpiece station and division headquarters in Scranton was a big part of our decision use it. The Radisson also offers several on site dining options, banquet options, a convenient downtown location, free airport shuttles, and necessary business meeting rooms which are all requirements when hosting a National Conference which sees attendees from all across the country. The events kicked off on Thursday, October 11, when the registration table opened near the front desk at the Radisson Hotel. 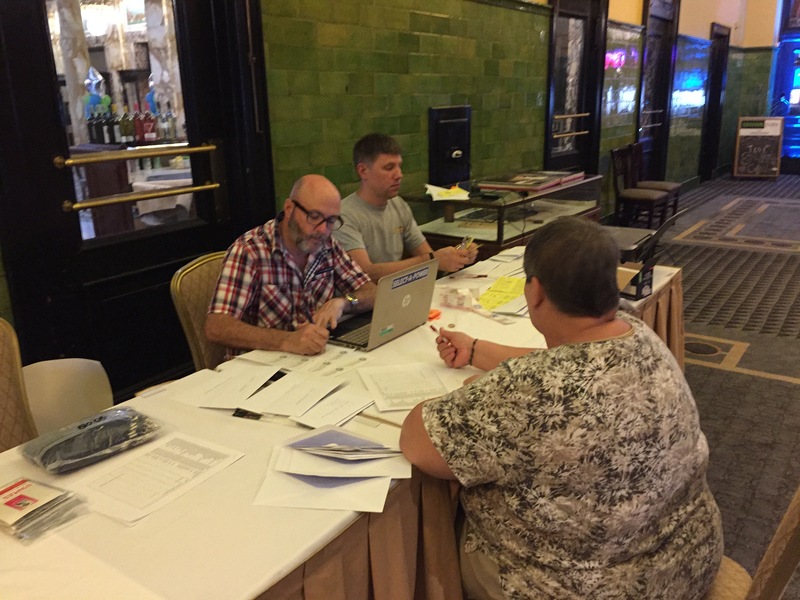 Neil Weinberg, Tim O’Malley, Tony Verbyla Jr., and Helen Shaak from the Lancaster Chapter, setup and opened the registration table at 3pm and began checking in the many out of town visitors for the NRHS Fall Conference. Later, at 7pm that night, the first of two free slideshows were held at “The Platform” on the backside of the Radisson hotel. The Platform is so named because it was actually the loading platform for Lackawanna and EL passenger trains. Up until 1970 is was still possible to board a passenger train bound for Chicago at the exact spot where we were now enjoying a slideshow. 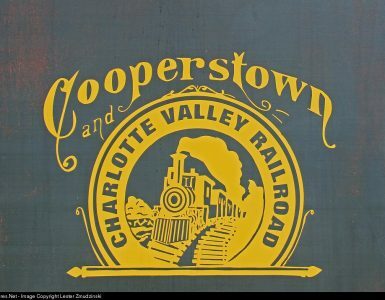 For the Thursday night slideshow, Ed Philbin gave a program on the history of the Lehigh Valley’s Mountain Cut-off and Ed Zech presented color railroad photography by the late Ed Miller. Friday, October 12 began with Neil Weinberg opening the registration table at 8am and attendees preparing for the 45th Anniversary train ride on the Delaware Lackawaxen & Stourbridge Railroad. Bus transportation to Honesdale was provided for the many passengers who were staying at the Radisson Hotel. 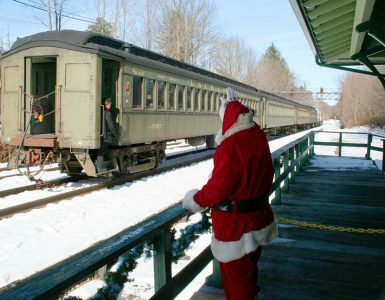 Arriving at Honesdale at 9:30am, passengers had 30 minutes to inspect and photograph the various pieces of equipment the Stourbridge Line has on display in Honesdale. Delaware, Lackawaxen & Stourbridge excursion on the first full day of the convention. Photo by Anthony Verbyla, Jr.
which included two photo runbys. 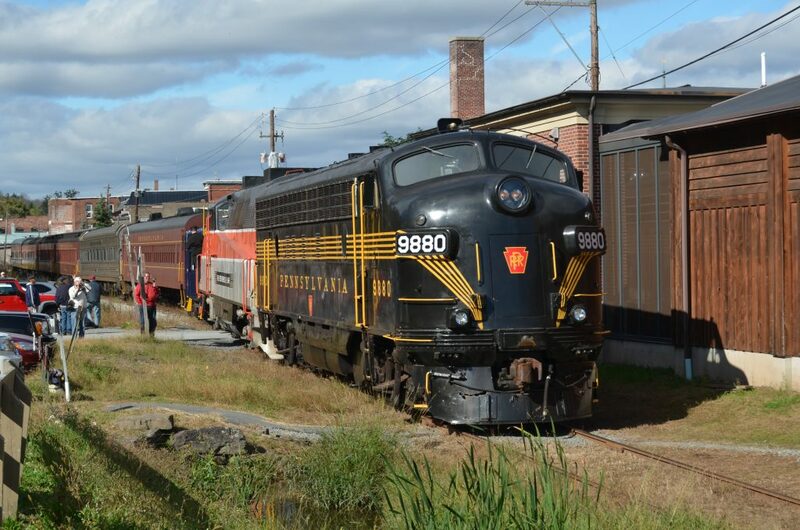 Power for the train was the beautiful PRR-painted FP-7 and Stourbridge Line BL-2 the railroad operates. DL&S owner Tom Myles was on board as well and made several rounds through the train talking to passengers about his railroad and railroad experiences in a career that started on the PRR (his love of the PRR quite apparent!). 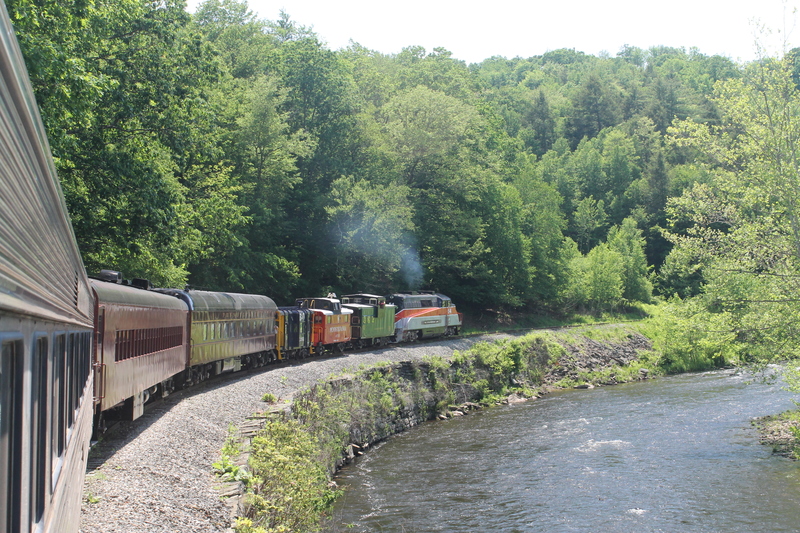 Upon arrival back in Honesdale, passengers had 45 minutes to photograph the excursion train or visit the Wayne County Historical Society Museum to see the D&H built replica of the Stourbridge Lion, first steam locomotive to operate on the North American continent in Honesdale on August 8, 1829. 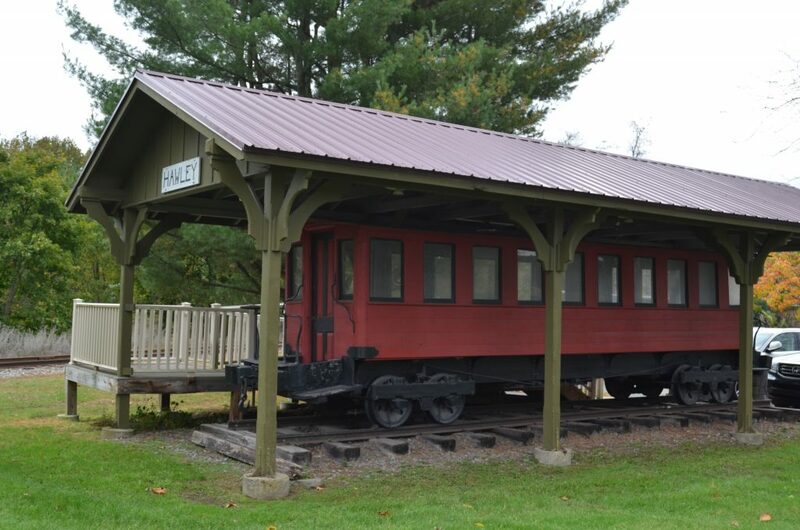 The return bus ride included a stop in Waymart to view a D&H Gravity Railroad coach and a drive by the D&H Gravity Railroad Farview Station. 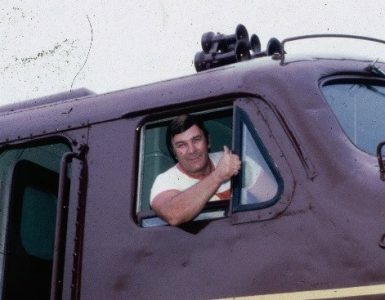 presented case studies of the many railroad accidents and incidents he investigated during his career as a Road Foreman and Trainmaster on the D&H. Saturday, October 13 Bob Young of Kingston opened the registration table at 7am and was assisted later in the day by Adam Budney and Roger Salerno. The NRHS Fall Conference business meetings began a few minutes late in Ballrooms 1&2 at 8:30am. The Advisory Council meeting was the first meeting of the day. The Advisory Council is comprised of the National Representatives from every chapter, myself being the Advisory Council member from the L&WV Chapter. The Advisory Council discusses NRHS business such as budgets, building membership, fund raising, and improving programs like Railcamp or Heritage Grants that the NRHS runs. From its discussion and debates, recommendations are made to the NRHS officers and Board of Directors. This arrangement of the Advisory Council advising and making recommendations to the NRHS officers and Board of Directors serves as a direct link for chapters and members to influence the direction of the NRHS. who were elected into office during the summer election. The Board of Director’s meeting wrapped up at 5pm and attendees had time to relax and prepare for our chapter’s 45th Anniversary banquet. favor of the L&WV Chapter “Hobo Mug” with an engineer’s handkerchief tastefully placed in the mug. Chapter President Vee Pauli served as banquet host welcoming guests with a comments on the chapter and its history. Tony Verbyla Jr. spoke of the NRHS National Conference and the 60-plus visitors from across the country joining us at the banquet. He also honored NRHS officers and our District 2 directors, noting the tough job of the many volunteers in the NRHS National who keep the organization in good working order. Vee Pauli honored charter L&WV Chapter members: Don Banks, Carl Packer, Tom Ide, Jim Kilcullen, and Bob Young of Moscow. Total banquet attendance was 102. Friday excursion, was our second speaker discussing his career in the railroad industry working for the PRR, Penn Central, Conrail, and CSX in many positions and locations throughout the systems. He also spoke of future plans for his Stourbridge Line operation. He was followed by Jim Ogle, NS Northern Region superintendent. Jim Ogle spoke of the rich history of NS and its operation in our region. The banquet ended with closing remarks from Tom Clark and Vee Pauli at 10pm. concluded with the train’s arrival back in Scranton. also supporting the members who have taken on the task of planning such events. 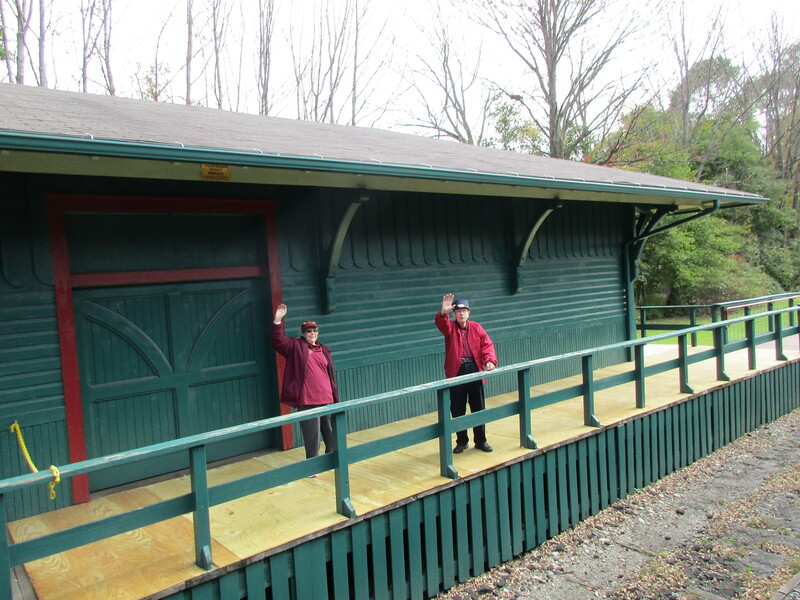 L&WVRHS President Vee Pauli and member Roy Pauli wave to the train from the Moscow, PA freight depot. Photo by Alyssa Sue Burrows. The support of fellow members means a lot those doing the planning. host the NRHS National for the conference. make the NRHS a successful organization. 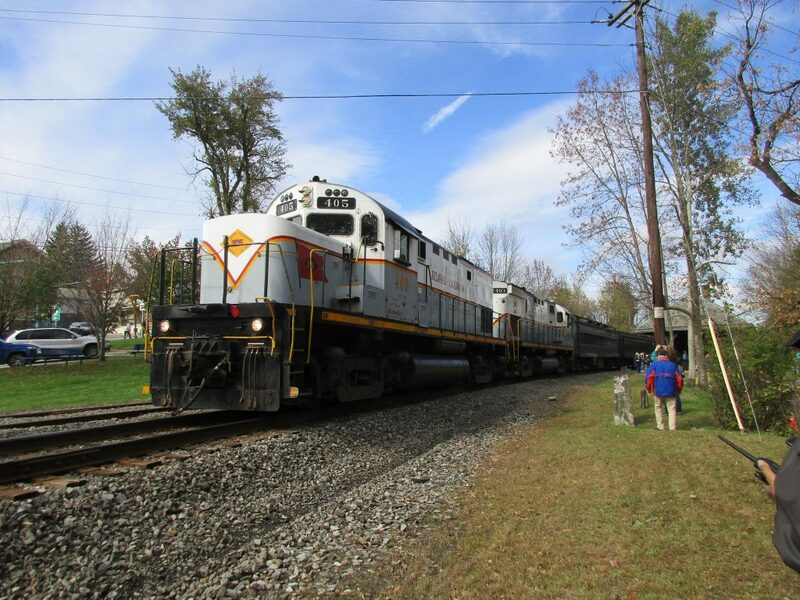 The L&WV Chapter is fortunate to count itself among some of the larger and more active chapters and can be proud of the fact they’ve hosted quality event for the NRHS, showcasing the dedication our chapter shows to railroad history.